Another day and another country added to the list. We left Egypt head headed for Jordan today. Neither of us was particularly looking forward to the journey as it was going to take all day and we would probably both end up cranky because of it. Sandy gets cranky when we have to travel long distances overland. I don’t have that much problem with the overland travel other than having to put up with her being cranky so we both end up in a bad mood after all. Since we had already settled up the bill with Henk last night, we made a quick escape from the hotel (having forgotten to pay our food and drinks tab) and bid our farewells. I left a generous tip for the dive centre staff and our dive master and Henk was good enough to have his driver drop us off at the bus station, where we duly bought our tickets for the three-hour coach ride to Nuweiba. It was an uneventful three hours on the coach but at least the air-conditioning was working this time. We stopped a few times on the way and our passports were examined at a couple of the checkpoints. The driver dropped us off somewhere in Nuweiba and pointed us in the direction of the ferry ticket office. In the sweltering heat of the day, carrying our full local of backpacks, the one hundred and fifty meter walk seemed to last for hours. We only had a limit amount of time to make the ferry connection and it took us ages to actually find the ticket office since each time we asked someone where to go, they sent us off in a different direction. We finally managed to find it tucked neatly away some distance from the entrance to the port but, of course, there was quite a queue once we got there. It took several minutes for the queue to whittle down, at which point a Japanese tourist informed us that they would only accept US dollars. Once again we found ourselves in a situation where the only currency we had on us was local currency and it was useless. Just exactly why so many countries refuse to take their own currency is beyond me. I was in no mood to look for a place to stay for the night so I went off in search of somewhere to change up our remaining Egyptian Pounds into US dollars. The exceedingly unhelpful chap at the ticket office told me that I could change money just about anywhere, including the nearby supermarket so I made this my first destination. They were quite happy to accept US dollars but would not sell them. I tried another place and then another and the story was the same everywhere. It was just like Zimbabwe all over again – desperately in need of dollars but no means of obtaining them. Luckily, or so I thought, there were several banks within walking distance - although the distance between me and the ticket office where Sandy and all our bags were still waiting for me, was getting ever larger. The first bank didn’t have any dollars in stock. It was the same story with the next three and my stress levels were now starting to rise due to the clock screaming in my ear. Each of the banks had exchange rates for US dollars posted on their electronic boards but none of them were prepaid to part with any. This left just one option – to plead with the ferry staff. I spoke with one of the white uniforms at the port gate and explained my predicament. He was actually quite helpful and told me that if we could make it back to the gate in just a couple of minutes, we would be able to arrange payment on the ferry itself, where there is apparently a Bureau De Change. He made a point of telling me to hurry up as time was running out and I sprinted back to the ticket office to collect Sandy and all the bags. By this time the ticket office was now closed so it was a good I found a helpful uniform when I did. Another couple of hundred meters with a full load in the blistering heat separated us from our ferry ride but it certainly seemed like a lot more. With a few Arabic words directed at the right baggage personnel, we were inside the terminal and in the waiting hall. We had to clear the usual formalities with the immigration department but we made it to where the rest of the herd where waiting to get onto the bus to the ferry with some time to spare. There must have been well over three hundred other people waiting in the departure hall. It was extremely hot and very stuffy with almost every square inch of floor space occupied by people and or luggage. We sat against the back wall next to a group of friendly, young, Palestinian guys and we had an amusing time trying to communicate. I also struck up a conversation with two Jordanians, as we later learned, that were very helpful in helping us bridge the communications gap with the various staff members about when the ferry would leave, what to do with our luggage and so on. We got quite friendly with them after a while and they were ultimately instrumental in smoothing the way for us to arrange our ticket on board. In fact, they went well out of their way to make life easy for us and I remember drawing a parallel between them and the nice Egyptian immigration officer we met outside of the airport in Cairo. One of the two Jordanians was and entrepreneurial businessman and the other was a photography. They had just been to Cairo to strike up a business deal for purchasing some papyrus. The businessman knew the captain of the ferry, as it turns out, and arranged for us all to sit upstairs in first class. In effect, these two friendly gentlemen had ensured a smooth introduction to Jordan for us. I’ve been quite apprehensive about going to Jordan. Not because I perceive the place to be dangerous or dodgy, but moreover because we have no guidebook for it and no idea about what to do or where to go after disembarking from the ferry. We knew that we wanted to go to Petra but other than that, we were travelling blind and we’ve never been in that situation before. Another two French women sitting in first class were apparently also in the exact same situation as us. They didn’t know where they were going after arriving in Aqaba and were also planning on somehow taking in Petra for a couple of days. We got to know each other a bit better and decided that there would be strength in numbers so we agreed to travel together for a while. Suddenly, Jordan was not looking quite so daunting any more. The very fast Ferry ride took a little over an hour and a half and was the smoothest ferry ride I’ve ever been on. The waters were as calm as they were in Sharm and the speed of the ferry must also have helped stabilize it. As a result, we could feel no sway at all, although I took a couple of Cinnarizine tablets just the same. Disembarking from the ferry and clearing all the formalities on the other side was just as laborious as at any other country we’ve visited, with the exception of the intense heat. We had been following in the footsteps of a large and rather unorganised Japanese contingent since Nuweiba and we were eager to put some distance between them and us. We eventually cleared customs, immigration and changed the remainder of our Egyptian money into Jordanian Dinars (JDs as they are referred to here). As was the case with the Dirhams we bought in Dubai, one Jordanian Dinar is worth more than one US dollar. After the six of us were completely through to the other end of the terminal, we ran the gauntlet of taxi drivers and touts for a while before getting the shuttle bus out of the terminal and over to another taxi rank just a few hundred yards away. Our Jordanian business friend had given us plenty of options for what to do next but the four of us eventually decided on a taxi straight into Petra whilst the two of them went into the city of Aqaba for the night. They made all the necessary arrangements with the taxi driver and left us with their phone number to use if we ever needed it. They were both very friendly and very helpful people and we may very well take them up on their offer to look them up when we get to Amman. Our taxi driver was great. He made us feel right at home. He took us to get some water and to change money in Aqaba and he even stopped several times along the route to Wadi-Musa (near Petra) to take photos. Almost immediately, I fell in love with Jordan. It’s a very much nicer pace than Egypt. I liked Egypt as far as the activities we got into (and not forgetting Ehab – our fantastic, personal guide) but the country itself looks very run down and sorry for itself. Jordan, on the other hand is very much better developed. It is still a country dominated by desert landscape but the roads are in very good condition, there is very little litter and the whole place just seems very much better organised. During our two and a half hour sojourn to Wadi-Musa, our taxi driver gave us quite a bit of information about Petra and some other things that we might be able to do during our short stay here. What sounded particularly interesting was a guided tour from Petra all the way to Amman over the course of a day, which would take in the Dead Sea, as well as a few other sites of general interest along the King’s Highway. This trip would set us back about JD75 ($113) but it would kill several birds in one stone and thus we would be better off financially. Upon arrival in Petra, we looked at a few hotels but ultimately went with the taxi driver’s suggestion. At just JD9 ($13) per night, we are quite pleased with it and so are the two French girls. 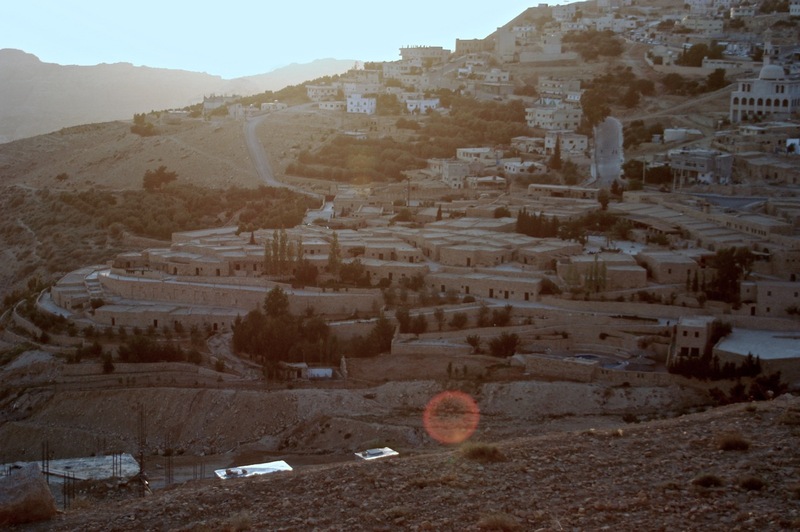 Wadi-Musa is situated in a steep incline and walking anywhere involves a lot of hard work as. I soon learned after going down to the local Internet Café for an hour or so. Sandy and the French girls elected to pay the JD3 per person cover charge for the hotel buffet but I think I did better with a half an hour connected to the internet as well as a burger, chips and a can of Pepsi all for just JD2,5. Tomorrow we take on Petra and I certainly hope it’s worth the effort. It’s practically the only reason we are in Jordan at all and I have high hopes that we will be awestruck when the hotel transportation drops us off tomorrow morning.